A pharmaceutical company accused of bribing doctors to boost sales of its synthetic opioid medication gave tens of thousands of dollars to Oklahoma doctors over the past four years in connection with the medication, an investigation by The Frontier has found. All told, pharmaceutical companies paid nearly half a million dollars to more than 1,300 Oklahoma physicians between 2013 and 2016 promoting opioid prescription drugs, according to doctor payment data from the Center for Medicare and Medicaid Services. And though most physicians received less than $100 from companies promoting opioid medications (usually in the form of meal payments), some received tens of thousands of dollars for speaking engagements, consulting and travel, according to the data. The company with the largest amount of payments to Oklahoma doctors was Insys Therapeutics, an Arizona-based company and manufacturer of the powerful painkiller brand-named Subsys, meant for use by some cancer patients. In late October, the company’s founder John Kapoor was arrested in Arizona after being added to a federal indictment of company officials alleging, among other things, that several top executives and sales reps participated in a scheme to bribe doctors around the nation to prescribe Subsys to non-cancer patients by using a “speaker’s program” that paid doctors based on the amount of prescriptions written for Subsys. Payments from Insys accounted for more than a third of the $497,246 total spent by all pharmaceutical companies in the promotion of opioid medications to Oklahoma doctors between 2013 and 2016, the CMS data shows. Nearly 85 percent of the $173,729 Insys spent on doctors in Oklahoma during that time went to only two Tulsa physicians, the data shows. Dr. Terri Lynne White, a partner of Pain Management of Tulsa, received $91,816 from Insys, and Dr. Venkatesh Movva, who has since moved to Texas, received $55,055. Most of the payments came in the form of speaking payments, according to the CMS data. Payments for speaking engagements, travel or meals to doctors by pharmaceutical companies or medical device manufacturers promoting a drug or product are legal, but must be reported to the federal government. Though full publicly-available prescription data for Subsys is limited, White and Movva were two of only three doctors in the state to file claims with the Medicare Part D prescription drug program between 2013 and 2015, according to data from CMS. Together, both doctors prescribed more than $2.3 million worth of Subsys through the Medicare Part D program during that time. The third doctor shown as prescribing Subsys through Medicare Part D was Oklahoma City doctor Harvey Jenkins Jr., who is facing unrelated charges of overprescribing opioids to patients. Jenkins, whose medical license was suspended in 2015 and was charged in 2016, prescribed $333,469 worth of the drug from 2014 to 2015, the CMS prescription data shows. Neither White nor Movva have been accused of wrongdoing by law enforcement or the Oklahoma Board of Medical Licensure and Supervision, and neither doctor has been disciplined by the board in relation to any past allegation of misconduct. Neither doctor responded to multiple requests by The Frontier for an interview. In an interview with The Frontier, the former specialty sales representative and regional sales trainer for Insys Therapeutics in Tulsa, Casey Hanoch, confirmed that White and Movva were part of the company’s speaker program. He said he was not aware of any cases where doctors he worked with took money in exchange for prescribing the drug. However, Hanoch, who was hired by Insys a month before the company began selling the product in March 2012 and left the company in October 2014, said he and other sales reps were under constant pressure by higher-ups in the company to boost sales of the drug. Hanoch said he often had to act as a buffer between the corporate executives at Insys pushing for higher sales and the doctors he worked with in Tulsa and other parts of the sales territory, which also included Arkansas and western Kansas. Hanoch, who now lives in Texas, said he was one of several Insys employees who were subpoenaed to testify in front of federal the grand jury in Boston, Massachusetts, that recently indicted Insys founder Kapoor. A spokesman for Insys Therapeutics did not respond to an interview request from The Frontier. R. Trent Shores, U.S. Attorney in Tulsa for the Northern District of Oklahoma, said he was aware of the Insys Therapeutics case from media reports, but could neither confirm nor deny whether his office was taking part in any related investigation. Over the last few years, Oklahoma and the nation have seen an increase in fatal fentanyl overdoses, though it’s hard to tell in some cases whether it is from medication or black market fentanyl that mostly originates in China, said Mark Woodward, spokesman for the Oklahoma Bureau of Narcotics and Dangerous Drugs. In 2016, 81 people died from fentanyl overdoses, while there were 70 fentanyl overdose deaths in 2015 and 41 in 2014, Woodward said. That increase is most likely because of a rise in non-medication fentanyl on the streets, he said. Last month, President Donald Trump declared the opioid epidemic a “national health emergency,” and federal law enforcement agencies have also been directed to increase focus on opioids. The roles played by pharmaceutical and distribution companies have especially come under scrutiny. Earlier this year, the Cherokee Nation filed a lawsuit against several pharmacies and distribution companies, while several state attorneys general, including Oklahoma Attorney General Mike Hunter, have filed lawsuits against opioid manufacturing companies. This summer, Hunter filed suit in Cleveland County against the Purdue pharmaceutical companies, Teva Pharmaceuticals, Johnson & Johnson, Cephalon, Janssen Pharmaceuticals, Allergan, Watson Laboratories, and Actavis Pharma. Insys Therapeutics is not named as a defendant in that case. In October, during Sessions’ visit to Oklahoma, Hunter asked him to put greater focus on the role of pharmaceutical companies in spreading opioid addiction and urged that companies that played a part in the epidemic be treated “like the criminal enterprises they are” through the use of federal anti-racketeering statutes. Subsys is made from fentanyl, a synthetic opioid considered to be 25 to 50 times as potent as heroin, 50 to 100 times more potent than morphine and among the most potent opioids available for human use. It is administered in micrograms rather than milligrams, and compared to other opioid-type drugs, fentanyl’s effects have a relatively rapid onset and short duration. While breakthrough pain has been treated using fentanyl in pill, patch and lozenge form, Subsys was unique, in that it comes in a spray form and is meant to be administered under the tongue. The drug’s label warns that it poses the risk of misuse, abuse, addiction, overdoses and serious complications due to medication errors. When the FDA approved the drug, it was categorized as a Transmucosal Immediate Release Fentanyl (TIRF) drug subject to the Risk Evaluation and Mitigation Strategy Access Program. In short, that means that the patient, prescriber and pharmacy dispensing the drug are each required to be educated about the drug’s risks before it can be prescribed. Both the rate and extent of absorption of the spray were determined to be substantially different from other fentanyl products, meaning the substitution of the same dose of Subsys for the same dose of any other TIRF drug came with a substantial risk of overdose. However, Subsys was entering a limited and somewhat crowded market. Nationwide, fewer than 1,900 practitioners wrote 90 percent of all TIRF product prescriptions, practitioners had a large number of TIRF drugs to choose from and generic forms of TIRF medicines made up nearly two-thirds of all TIRF prescriptions, according to court documents. Furthermore, Subsys was expensive. Because of the relatively high price, most insurance companies required prior authorization for Subsys before paying for it, and were unlikely to pay if the drug had been prescribed “off-label” for non-breakthrough cancer pain, according to court documents. In March 2012, Insys launched its marketing campaign for Subsys, planning and funding a “speaker program” intended to increase brand awareness of the drug. Insys sales representatives were to recruit doctors and other licensed practitioners who were to be part of the speaker program and provide peer-to-peer lectures about the benefits and use of Subsys at lunch and dinner events, court documents state. The speakers — who were chosen based on skill in the use of opioids, experience with Subsys, geography, prominence and experience as speakers — were required to sign agreements with Insys and attend organized training sessions. In exchange for their services, the speakers would be paid per speaking event by Insys, prosecutors said. But, according to prosecutors, by the end of June 2012 — before the speaker’s program events launched and while most of the speakers were still undergoing training — high-level executives at Insys had already grown dissatisfied with sales. On Oct. 26, a federal indictment of billionaire Insys Therapeutics founder Kapoor was unsealed. Kapoor had been added to an earlier criminal indictment of other Insys executives — president and CEO Michael Babich, vice president of sales Alec Burlakoff, vice president of managed markets Michael Gurry, national director of sales Richard Simon, regional sales manager Sunrise Lee and regional sales manager Joseph Rowan. The executives are accused of conspiring to violate federal racketeering, mail fraud, wire fraud and anti-kickback laws by operating a nationwide program designed to pay doctors to write large numbers of prescriptions for Subsys and defrauding insurers to pay for prescriptions. The company also faces several civil lawsuits filed throughout the country in connection with the alleged scheme by family members of patients who died from the drug, state attorneys general and insurance companies. Some doctors and company sales representatives have also been criminally prosecuted for their involvement in the alleged scheme. At the end of the first quarter it was available, Kapoor and Babich were not happy with the sales of Subsys, prosecutors said, and hired Burlakoff as the Southeast Regional Sales Manager. Burlakoff, according to prosecutors, began telling sales representatives that the key to sales was using the speaker program to pay practitioners to prescribe Subsys. It did not matter how good at communicating a speaker was, only whether they wrote a lot of prescriptions for Subsys, prosecutors have alleged. Three months after being hired, Burlakoff was promoted to vice president of sales for Insys, meaning he supervised all of the company sales managers and representatives, prosecutors said. Though Subsys was meant for cancer patients, physicians who focused on treating cancer were not usually high-level TIRF drug prescribers. So Insys executives and sales representatives targeted their efforts toward practitioners from pain management clinics and practitioners who would write prescriptions for TIRF medications for all types of pain, prosecutors allege. In 2014, Burlakoff would allegedly tell employees that the market for breakthrough cancer pain was “small potatoes,” and along with other company officials pushed sales reps encourage doctors to write prescriptions for Subsys “off label” to non-cancer patients, the indictment states. Company executives also offered bonuses for selling stronger doses of the drug, and actively discouraged the sale of lower doses of the drug — despite the FDA’s warning that patients starting the medication should start out at the lowest dose, 100 mcg, court records indicate. The company went as far as producing a video shown during its 2015 national sales meeting featuring sales reps rapping and singing with Burlakoff, who was wearing a costume of a 1600 mcg (the largest dosage of the drug available) bottle of Subsys, to encourage sales reps to push physicians to prescribe higher doses, the indictment states. According to the indictment, the company and its executives tracked how many prescriptions of Subsys the practitioners in Insys’s speakers program had written, the net revenue earned by the company from each speaker, the number of prescriptions written by speakers for competitors’ products, and the ratio of return on investment for each speaker. Those with a ratio of return on investment of less than 2:1 usually faced negative consequences of some sort, the indictment states. Practitioners who did not write the appropriate number of prescriptions for Subsys often had the number of scheduled speaker programs — and thus the amount they were paid by Insys — reduced by company officials, unless the practitioner wrote more prescriptions, prosecutors state. “Between August 2012 and 2013, the use of speaker fees to bribe high decile targets to write prescriptions for the Fentanyl Spray outside the usual course of their professional practice became endemic within the Company sales force,” the indictment reads. The total amount budgeted by Insys for the speaker program in 2013 was $2.25 million and 2014’s budget was more than $10 million, the indictment states. Unnamed practitioners in the indictment offered as examples of illegal acts would each receive tens or hundreds of thousands of dollars in bribes through the speakers program while prescribing thousands of doses of Subsys between 2012 and 2015. The events were often attended by the same repeat attendees who were friends of the practitioner, the practitioner’s support staff. Sometimes no attendees showed up at all and attendance logs were falsified, the indictment alleges. However, most insurance companies required prior authorization before paying for a prescription of Subsys. Obtaining prior authorization is often time-consuming and costly for practitioners, and support staff are often required to navigate the process and paperwork. According to federal prosecutors, Insys had a solution. For doctors who prescribed large amounts of Subsys, Insys would hire “Area Business Liaisons” and “Business Relations Managers,” who would act as the doctor’s support staff by filling out and faxing prior authorization paperwork and other documentation, the indictment reads. Prosecutors consider this another form of kickback, and in some cases the practitioners’ friends or family was hired by the company. In January 2013, the company launched a new unit at its Arizona headquarters, initially named the Reimbursement Center, that was dedicated to obtaining prior authorizations directly from insurers and pharmacy benefit managers, the indictment alleges. Practitioners who used the reimbursement center were required to fill out “opt-in” forms that sought confidential patient information. The forms and other patient medical records were then faxed from the practitioner’s office by office staff, Insys sales reps, the area business liaisons or business relations managers to the reimbursement center, the indictment states. Insys employees at the center would then seek prior authorization from the insurance company for the prescription. Prosecutors allege employees at the reimbursement center would attempt to conceal who they worked for from the insurance company. Those employees would also read from a script that was intended to conceal the fact that a patient did not have cancer, or make up other diagnoses to obtain prior authorization, prosecutors aid. 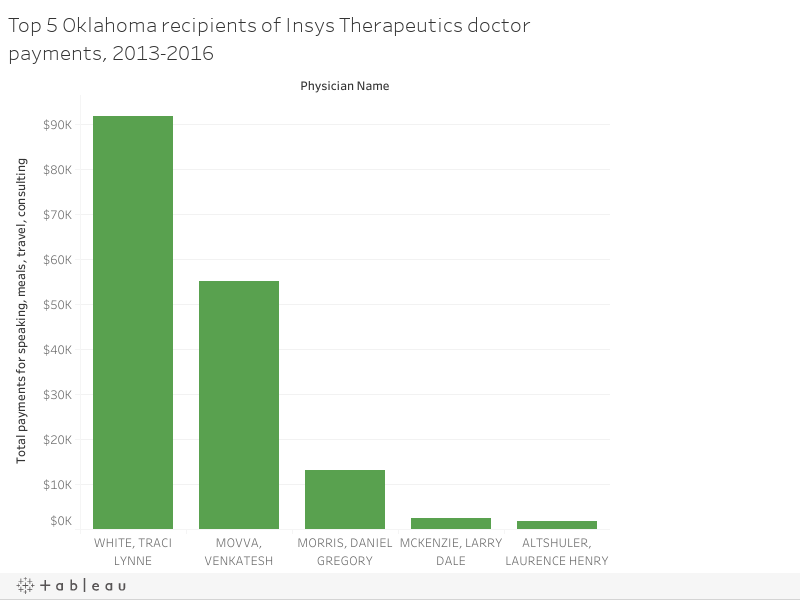 According to CMS data, White received the most money of any Oklahoma doctor from Insys between 2013 and 2016, followed by Movva, mostly in the form of speaker payments. A third Tulsa doctor, Daniel G. Morris was paid $13,062 by Insys in 2013, mostly for speaking engagements, but received little compensation from the company after that. Overall, White, Morris and Movva were also the top three recipients of all payments to Oklahoma doctors from pharmaceutical companies marketing opioid medications from 2013 to 2016, the data shows. The publicly available doctor payment data does not include payments made in 2012 (when the Insys speaker program started) or the first half of 2013. Though the data is limited, during 2013 White is shown as the only doctor in the state filing claims to Medicare Part D for prescriptions of Subsys. In 2014, Jenkins began making claims through Medicare Part D for the drug, and though the data shows Jenkins was filing claims for more beneficiaries (15 to White’s 11), total drug costs from White’s claims were more expensive. In 2015, the CMS data does not show the number of beneficiaries for White or Movva, indicating there may have been 10 or fewer. However, the data also shows that White filed claims 60 times for 30-day supplies of the drug and Movva filed 41, while Jenkins filed 14. The total drug cost for White’s claims that year came to nearly $1.1 million, while Movva’s came to around $158,736. Jenkins did not respond to a Facebook message from The Frontier seeking comment. Between June 2013 (when CMS began making doctor payment records public) and December 2016, Insys Therapeutics spent $174,000 on promoting Subsys to Oklahoma doctors, according to CMS data — more than any other pharmaceutical company promoting an opioid medication during that time. The next closest company promoting an opioid, in terms of general doctor payments, was Purdue Pharma, manufacturer of OxyContin. The amount paid by Insys was spread out over 734 different payments, consisting of speaker payments, consulting fees and meal payments. The $151,033 paid to doctors by Purdue was given in 4,329 separate payments, though it too made larger payments to some doctors for speaking fees. Hanoch, the former Insys regional sales trainer and specialty sales professional in Tulsa, said his sales numbers were consistently high, going from $0 to about $3 million during the first two years, according to Hanoch’s LinkedIn page. However, Hanoch said the Insys speakers program in Tulsa was not like what was happening at speakers programs in other areas of the country that are now the subject of federal investigations and indictments. Nothing illegal occurred and, Hanoch said, he and other sales reps tried to maintain ethical integrity when selling the product. Speaking events where no one was present or where only office staff were present were rare, and would only happen when those invited would cancel at the last minute or just not show up, he said. Often, speaking events would have large crowds he said, especially at places like the Cancer Treatment Centers for America facility in Tulsa, Hanoch said. “That’s an ideal location to have a speaking event because, one: it’s on label, two: the vast majority of patients there have private insurance which is obviously what any pharmaceutical company wants just because of reimbursement,” Hanoch said. Reception by physicians and mid-level practitioners to Subsys was somewhat mixed, however, Hanoch said. There were four doctors who did Insys speaking events in Tulsa, Hanoch said. 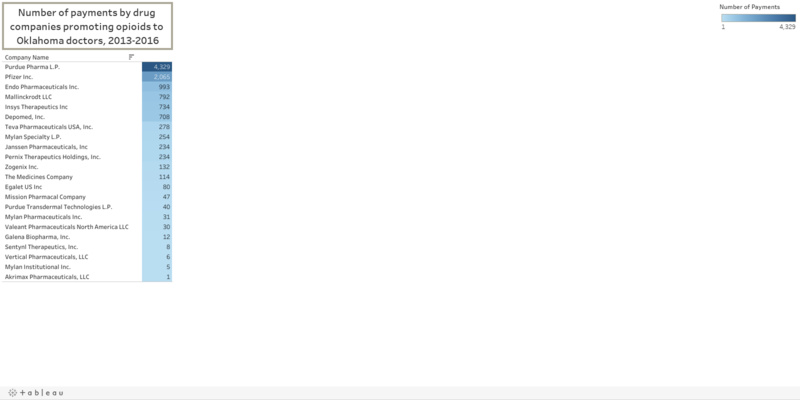 One — Morris — only lasted a short time, while White, Movva and a now-former doctor from the Houston area (who records show was paid around $63,000 between 2013 and 2015 by Insys) did most of the speaking events in the Tulsa area. Neither White nor Movva wrote the volume of Subsys prescriptions or had the number of patients that got other prescribers in trouble with the law, Hanoch said. Other doctors who were seeing patients with cancer would also refer their patients to White to treat their pain, Hanoch said. Hanoch said a couple dozen doctors in his sales territory prescribed the drug while he was at the company. Cancer centers were a target for sales by the company, Hanoch said. When communication did come down in writing from Insys higher-ups, they were usually carefully worded, Hanoch said. Eventually, many of the original sales representatives hired during the early days of Subsys left the company, Hanoch said. Hanoch’s wife Jennifer also worked for Insys, serving as a business relationship manager and specialty sales representative in Tulsa beginning between July 2014 and April 2015. She stayed on after Casey Hanoch left to help maintain the family’s income, he said. According to Jennifer Hanoch’s Linkedin page, her duties while serving as a business relationship manager for the company in Tulsa included assisting “with all company-based programs to ensure patients quickly received medication” by advocating for patient care and ensured the proper submission of records and files for insurance claims for the drug. She increased the approval rate for the drug to 98 percent within the first quarter, she wrote. Casey Hanoch said in almost all cases in which Subsys was prescribed — including those submitted by Tulsa doctors — the paperwork was sent to Insys’s reimbursement center. Hanoch said Kapoor’s indictment will probably not be the last in the case, and the alleged wrongdoing has brought a cloud of suspicion on doctors who truly believed in the drug they were prescribing. Hanoch said he eventually took a job with another pharmaceutical company in the Dallas area, but left shortly afterwards to start his own landscaping company. Hanoch said he feels he did good during the time he spent working for Insys — the drug helped patients who needed it and he made real friendships with the doctors he worked with — but the corporate values being passed down from above were not his. “I felt that I gave as much of myself as I could have. I thought it was a great opportunity in the pharmaceutical field, which is where I wanted to be,” Hanoch said. “I did well, I brought a lot of value to the company and trained a lot of people. There is some resentment about how it all went down. I don’t know.